Uncle Tobys muesli bars, Vitasoy, Nice & Natural nut bars, are all on sale at Coles stores this week. Pay only the half price for most of them. Moccona freeze-dried coffee, Nescafe Blend 43, Nescafe Cappucino, V8, and more beverage products are in this part of the catalogue as well. Check out the snack range starting on pg 16-17 where you have a classic list of deals including Coca-Cola, Cottee's Cordial, Cadbury Dairy milk, Kirks soft drink, V8 and Kettle chips. You can spot the half-price deal on 4 popular products such as belVita breakfast biscuits on pg 17. The details of products like Lipton ice tea, Pepsi Max, Doritos corn chips, and more snacks got featured on pg 18-19. Save $1.75 on Nutella Hazelnut spread. Pantry section of the catalogue is also interesting and profitable. Campbell's Real Stock of 1L will cost only $3! Save $1 on that product. Restock your coffee and find the products like Moccona Latte and Cappucino on pg 20. You can save $4 on Nestle Milo. Another great saving is $2.45 on Moccona freeze-dried coffee. Remember you will win a stikeez for $30 you spend. There are 24 of them. Sunrice Australian medium grain, Barilla, Nice & Natural nut bars, Nature Valley and more practical foods for those who hate to waste time cooking or having poor cooking skills. 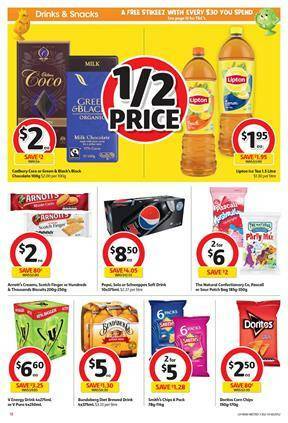 Check out all the deals on Coles Catalogue grocery, follow the Facebook page to track the future deals. New products are also available in this part of the catalogue. Streets Magnum 4-6 pack, Ben and Jerry's ice cream tub, Halo tub are the new offers.